You may recall that yesterday, we talked about how Sprint was preparing to release an official update to Android 4.4.2 KitKat for the Sprint Galaxy S III. This news came courtesy of XDA Senior Member poit, who noticed that Samsung had updated its Open Source Release Center page for the Sprint variant of the SGS3 to include the upcoming L710VPND8 update. And just one day later, the update is now here. As expected, today’s update comes in at firmware version L710VPND8. And according to Sprint’s update support page, ND8 brings the device’s long awaited “Android 4.4 Kit Kat update.” Aside from the increase in Android version number and the incorporation of Linux kernel 3.4, not much is known just yet about this update and what it brings. However, it’s not unreasonable to expect that ND8 brings with it some of the same refinements we’ve seen on other KitKat updates for Samsung devices such as a transparent status bar with white icons, and so on. The update is currently making its way out to consumer devices via a staged OTA rollout. This rollout began a couple of hours ago, and will continue over the course of the next week or so. Unfortunately, not every device will be in the initial wave. But thanks to XDA Recognized Contributor CNexus, this is not an issue, as he was able to capture the OTA update link directly on Google’s servers. But before you get to flashing, there are a few caveats with the OTA. For starters, ND8 brings a new Knox-enabled bootloader. Furthermore, this update has not yet been rooted. But if these issues aren’t a big deal for you, flash away. Just make sure that you’re on a stock, unmodified MK3 ROM first, and that you are running stock recovery. If you wish to get in on the update before it’s pushed to your device, head over to the captured OTA thread. 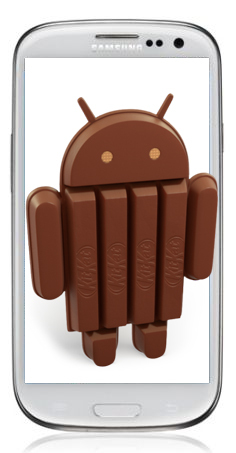 And if you wish to discuss what this update brings to the table, head over to the KitKat discussion thread.